Service towers have moved towards the Soyuz TMA-21 spacecraft, named after the first cosmonaut Yuri Gagarin, as it is set on its launch pad at Baikonur cosmodrome on April 2, 2011. The launch of the Russian manned spacecraft Soyuz TMA-21 is dedicated to the 50th anniversary of the first flight into space in 1961 carried out by Russian cosmonaut Yuri Gagarin. It is ready to blast off on April 5. The spacecraft will send three crews to carry out over 40 experiments for a six month mission to the International Space Station (ISS). The Soyuz TMA modification is a replacement of the Soyuz TM as it was equipped with smaller and more efficient computers and improved displays. 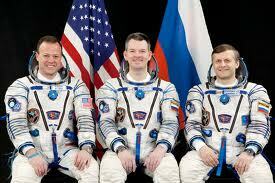 The Soyuz TMA-21 will also serve as the return vehicle of the ISS crew.